I’m fascinated by human psychology, and in particular online human psychology. What makes a user complete one action while ignoring another. How changing some text can double the number of desired actions, or changing the layout of your page can increase your profits exponentially. And so I’m also fascinated by User Experience (“UX”) and trying to apply online behavioural study from the user perspective. So this post will (almost) totally ignore SEO, and focus purely on some small changes I would make to the website of the Vhi, Ireland’s dominant private health insurance company, in order to improve UX by 100%. As a long-time Vhi customer I’m always delighted with the friendly customer-centric approach of their staff. Whenever I call their landlines the vibe and response of their call centre staff is quite inspirational. Seriously – I’ve never had a bad experience calling these guys. But does that translate to a great online experience? Click here.. oh it’s a button? Over the past few years I’ve grown more and more convinced that convention is a good thing. When I land on a web page it’s great to easily and quickly identify either what I’m looking for, or how to get there. In the case of the latter using conventionally styled hyperlinks can be a real plus. Did you notice that both original images used bulleted lists? But did you realise that one of those lists was actually live links while the other was not? That, in my opinion, confuses users. And confusion, or to be more correct, avoiding confusion, is one of the primary reasons I’m a convert when it comes to convention styling on links. I know that occasionally blue links wont fit with the theme of your site, but I don’t think you should ever use purple non-underlined text hyperlinks. This is doubly confusing because, by convention, purple is the colour conventionally used to signify a visited link. 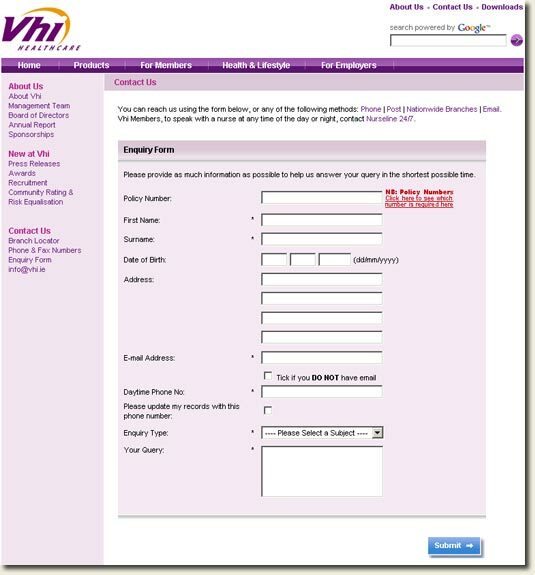 It appears however that the styling used on Vhi.ie is purple non-underlined for links the user has already visited (did you notice that on the ‘Phone’ link in Point 4. above?). 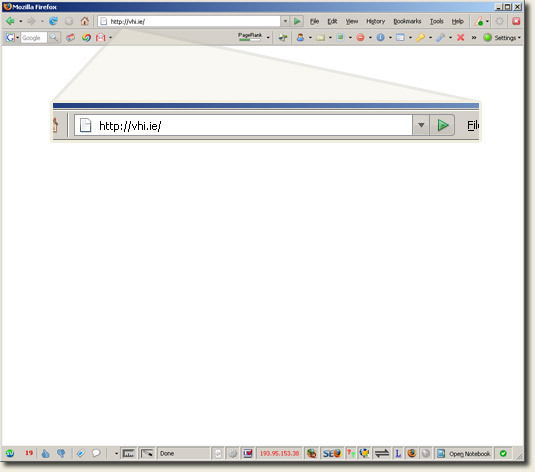 Not ideal in my view, and trivial to fix even for a large site like Vhi.ie (the joys of CSS!). So there’s Tip #3 – within body content use conventional blue underlined text for hyperlinks, purple for visited links. 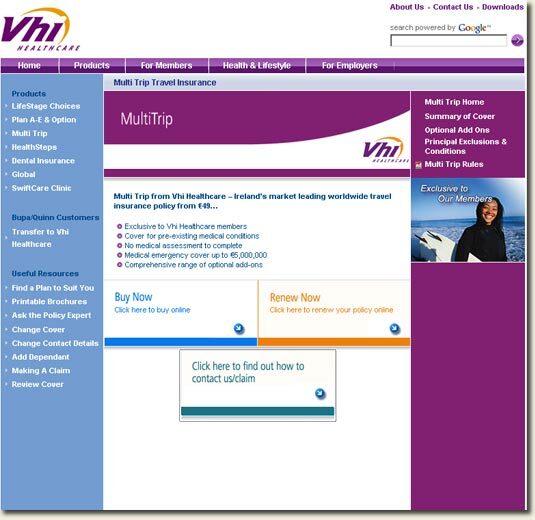 Multitrip Insurance Page – where I am within the site? Use a current class on primary and secondary navigation – active class styling on the Products link in the main navigation, and similarly, on the ‘Multi Trip’ link in the secondary navigation. So my pen-ultimate tip – give adequate indication of current location. It helps ground the user, and facilitates vertical navigation. 1. 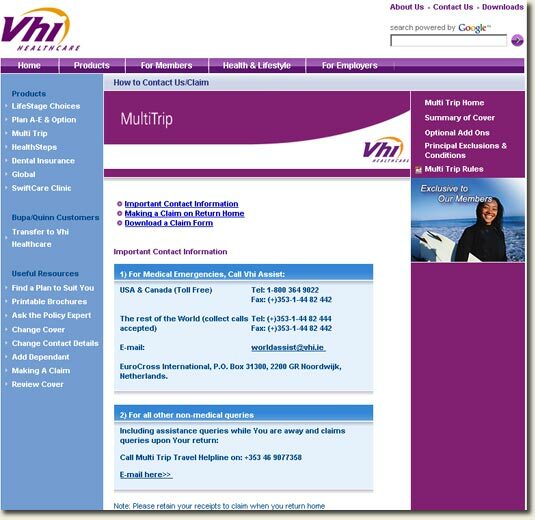 Where are you vhi.ie? Now generally I would advise serving content on either www or non-www, but not both. If you do serve on both then you should ensure that each is the same. This case however is the worst possible schenario – consider the number of Internet users who do not know the technical difference between www and non-www. Many less-savvy web users will not know to re-try www.vhi.ie when they see that blank page, and it should be a simple configuration change to ensure that both URLs resolve properly. 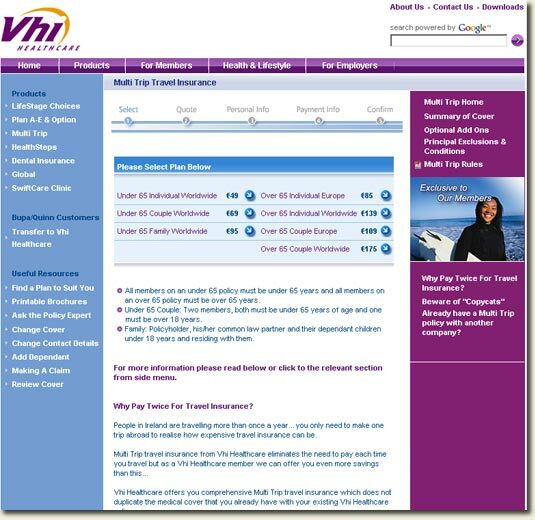 Given that www.vhi.ie is a transactional site fixing this issue will increase sales for Vhi.ie. Absolutely no doubt in my mind. So there you have it – how in 5 quite simple steps I think Vhi.ie could improve their UX (and perhaps their SEO also) by 100%. Nice analysis of VHI’s site. The non-www problem is something that has always puzzled me also. changing the htaccess to redirect to (what google calls) the canonical version of the domain is a 30 sec job. Makes you wonder sometimes! As usual some great tips on how people can improve their websites. The only thing I don’t agree with you on is the “Click here” point. From my experience, I always found that “telling” your visitors what to do will get better results in terms of click throughs and conversions. You should look at Brian Clark’s simple experiment – http://www.copyblogger.com/click-here/ – the results are very convincing. This does of course go against what the WAI accessibility guidelines, which is another days work – but none the less, I wouldn’t get VHI to change this, it’s probably the most clicked buttons on the site based on your other findings! I’m not actually against ‘click here’, just not happy when buttons look so little like buttons that ‘click here’ is required. I honestly think that designers should be able to come up with better mechanisms. Personal bias I suppose. I second your recommendation in staying with conventions, especially for hyperlinks. There are too many ways to make fancy links but only a few usable ones. @Neil D – your comment got filtered out by Askimet. Sorry about that. Thanks for commenting. @Richard – a very informative analysis on search engine optimisation you have there. btw, does the www and non-www only controllable through htaccess or through your domain name host? @Chad – it depends on the domain host I’d imagine. GoDaddy let you do some stuff like this. It also depends on your server OS. MS servers have a different way of handling this. You can also do the redirects at the script level. It incurs a little more overhead, and I’d always try to get the server to do this, but if all else fails use scripts.